Almost certainly yes — though not an identical twin. And so did every other Sun-like star in the universe, according to a new analysis by a theoretical physicist from the University of California, Berkeley, and a radio astronomer from the Smithsonian Astrophysical Observatory at Harvard University. Astronomers have even searched for a companion to our Sun, a star dubbed Nemesis because it was supposed to have kicked an asteroid into Earth’s orbit that collided with our planet and exterminated the dinosaurs. It has never been found. The new assertion is based on a radio survey of a giant molecular cloud filled with recently formed stars in the constellation Perseus, and a mathematical model that can explain the Perseus observations only if all Sun-like stars are born with a companion. In this study, “wide” means that the two stars are separated by more than 500 astronomical units, or AU, where one astronomical unit is the average distance between the Sun and Earth (93 million miles). A wide binary companion to our Sun would have been 17 times farther from the Sun than its most distant planet today, Neptune. Stahler and Sadavoy posted their findings in April on the arXiv and is available online. Their paper has been accepted for publication in the Monthly Notices of the Royal Astronomical Society. Astronomers have speculated about the origins of binary and multiple star systems for hundreds of years, and in recent years have created computer simulations of collapsing masses of gas to understand how they condense under gravity into stars. 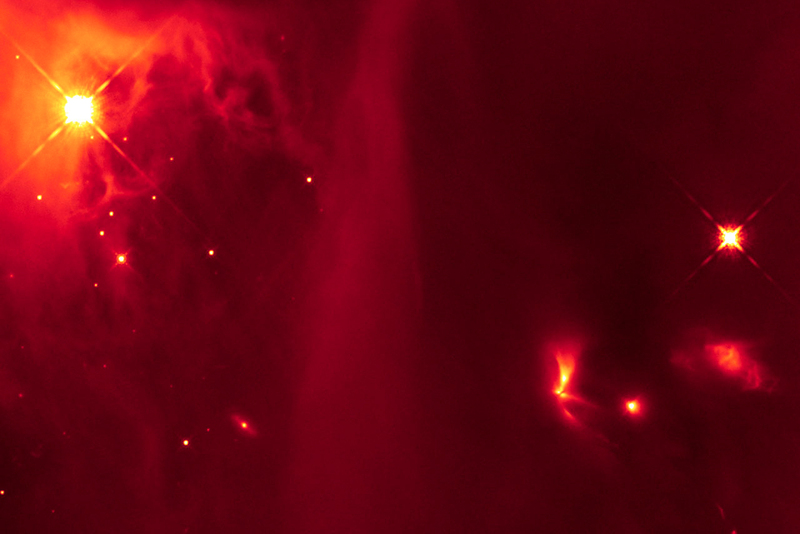 They have also simulated the interaction of many young stars recently freed from their gas clouds. 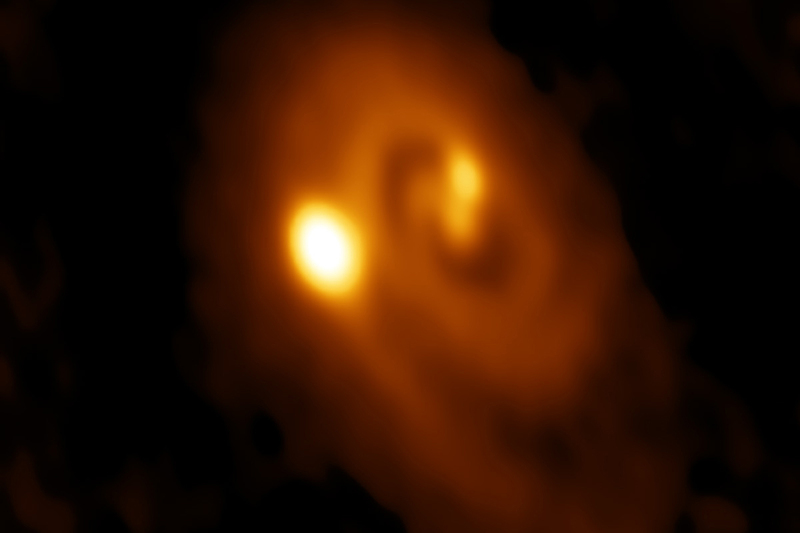 Several years ago, one such computer simulation by Pavel Kroupa of the University of Bonn led him to conclude that all stars are born as binaries. Yet direct evidence from observations has been scarce. 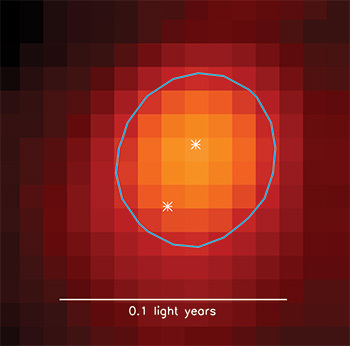 As astronomers look at younger and younger stars, they find a greater proportion of binaries, but why is still a mystery. According to Stahler, astronomers have known for several decades that stars are born inside egg-shaped cocoons called dense cores, which are sprinkled throughout immense clouds of cold, molecular hydrogen that are the nurseries for young stars. Through an optical telescope, these clouds look like holes in the starry sky, because the dust accompanying the gas blocks light from both the stars forming inside and the stars behind. The clouds can, however, be probed by radio telescopes, since the cold dust grains in them emit at these radio wavelengths, and radio waves are not blocked by the dust. The Perseus molecular cloud is one such stellar nursery, about 600 light-years from Earth and about 50 light-years long. Last year, a team of astronomers completed a survey that used the Very Large Array, a collection of radio dishes in New Mexico, to look at star formation inside the cloud. 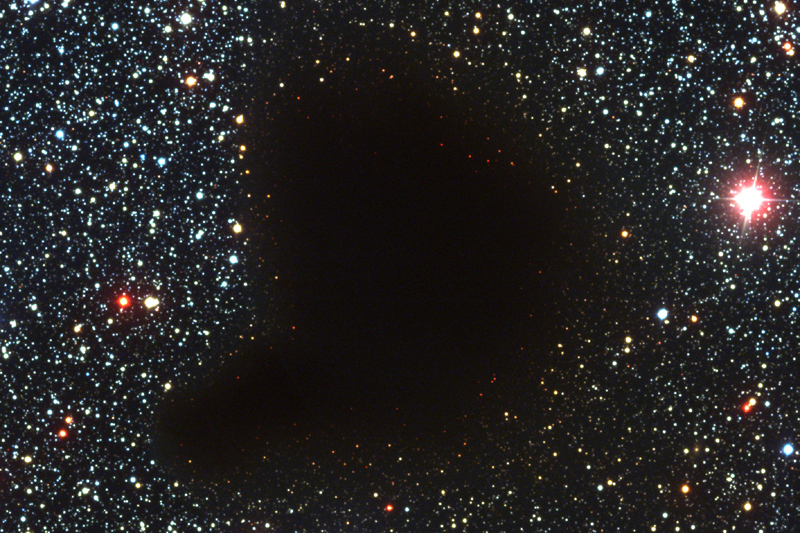 Called VANDAM, it was the first complete survey of all young stars in a molecular cloud, that is, stars less than about 4 million years old, including both single and multiple stars down to separations of about 15 astronomical units. This captured all multiple stars with a separation of more than about the radius of Uranus’ orbit — 19 AU — in our solar system. Stahler heard about the survey after approaching Sadavoy, a member of the VANDAM team, and asking for her help in observing young stars inside dense cores. The VANDAM survey produced a census of all Class 0 stars — those less than about 500,000 years old — and Class I stars — those between about 500,000 and 1 million years old. Both types of stars are so young that they are not yet burning hydrogen to produce energy. Sadavoy took the results from VANDAM and combined them with additional observations that reveal the egg-shaped cocoons around the young stars. These additional observations come from the Gould Belt Survey with SCUBA-2 on the James Clerk Maxwell Telescope in Hawaii. By combining these two data sets, Sadavoy was able to produce a robust census of the binary and single-star populations in Perseus, turning up 55 young stars in 24 multiple-star systems, all but five of them binary, and 45 single-star systems. Using these data, Sadavoy and Stahler discovered that all of the widely separated binary systems — those with stars separated by more than 500 AU — were very young systems, containing two Class 0 stars. These systems also tended to be aligned with the long axis of the egg-shaped dense core. The slightly older Class I binary stars were closer together, many separated by about 200 AU, and showed no tendency to align along the egg’s axis. Stahler and Sadavoy mathematically modeled various scenarios to explain this distribution of stars, assuming typical formation, breakup and orbital shrinking times. They concluded that the only way to explain the observations is to assume that all stars of masses around that of the Sun start off as wide Class 0 binaries in egg-shaped dense cores, after which some 60 percent split up over time. The rest shrink to form tight binaries. Their theory implies that each dense core, which typically comprises a few solar masses, converts twice as much material into stars as was previously thought. Stahler said that he has been asking radio astronomers to compare dense cores with their embedded young stars for more than 20 years, in order to test theories of binary star formation. The new data and model are a start, he says, but more work needs to be done to understand the physics behind the rule. Such studies may come along soon, because the capabilities of a now-upgraded VLA and the ALMA telescope in Chile, plus the SCUBA-2 survey in Hawaii, “are finally giving us the data and statistics we need. This is going to change our understanding of dense cores and the embedded stars within them,” Sadavoy said.